I earned my BS in meteorology with a minor in mathematics from Metropolitan State University of Denver in May of 2011. My first on air job was in West Texas at KWES doing weekend weather for 1 year, but was hired as chief meteorologist for KREX in western Colorado in late 2012. 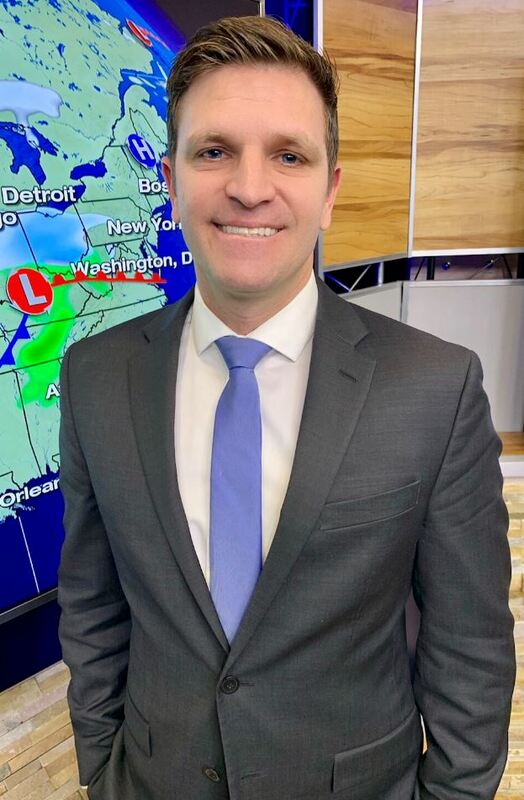 I remained there for six years until I had the amazing opportunity to join the WeatherNation team in early January 2019. Needless to say, I am thrilled to be back living in Denver with my wonderful family and to have the chance of working with the amazing staff here at WeatherNation. Growing up in south Florida, I always loved watching afternoon thunderstorms develop. As a kid, I vividly remember the heavy rains, frequent lightning and gusty winds that would accompany these storms. It was at this age I knew I wanted to study and learn the science of meteorology. One day while snorkeling in the Gulf of Mexico, my family and I had to quickly swim back to our boat, jump in and avoid a large waterspout that had formed while we were diving. It took us all by surprise how close it was to our location and how beautiful yet ominous looking it was. It had perfect cone shaped structure and danced in the open waters for what seemed like forever. This was also my first opportunity to photograph such an intense meteorological event. I was probably 12 or 13 at the time. Outside of weather, what are your hobbies and interests? When I’m not forecasting weather, you can find me with my family camping in the gorgeous Rocky Mountains, fishing, hiking and exploring. During the winter, I’m up at the local ski resorts enjoying fresh powder turns, and teaching my 4-year-old son how to find his balance on his snowboard with my wife by our side. Besides your parents, who as influenced you the most in your life? Besides the cliché answer of my wife and son giving me inspiration to be a great husband and Dad, I think my internship with Denver 7News chief meteorologist Mike Nelson was truly inspirational. He’s shown me the motivation/dedication needed to succeed in this business and how to achieve these goals. What people may not know about me is that I’m a bonafide weather nerd who loves to surf and snowboard. I’ve surfed Costa Rica in a month long surf adventure with my friends and have traveled three times to Hawaii to surf the big waves it offers. I also love to spear fish and catch lobster. My first large mouth bass was a whopping 8.5 lbs with my father in Lake Okeechobee in Florida. My dreams in this business are to generate a following of trusting viewers at WeatherNation and to properly forecast severe weather in a calm, professional and timely fashion. Also, I want to help protect and save lives during weather outbreaks, and to be educational as well as entertain-able in each broadcast.